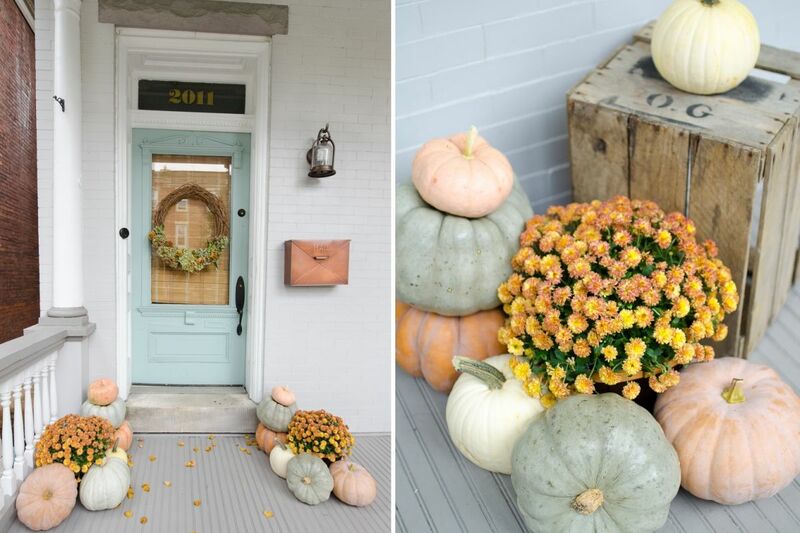 Nothing says you’re ready for fall like a porch full of seasonal goodies like pumpkins, autumn flowers, wreaths made of fallen leaves and pretty much anything in fall-ish colors. Coming up with the perfect combo is not as tricky as you may think. 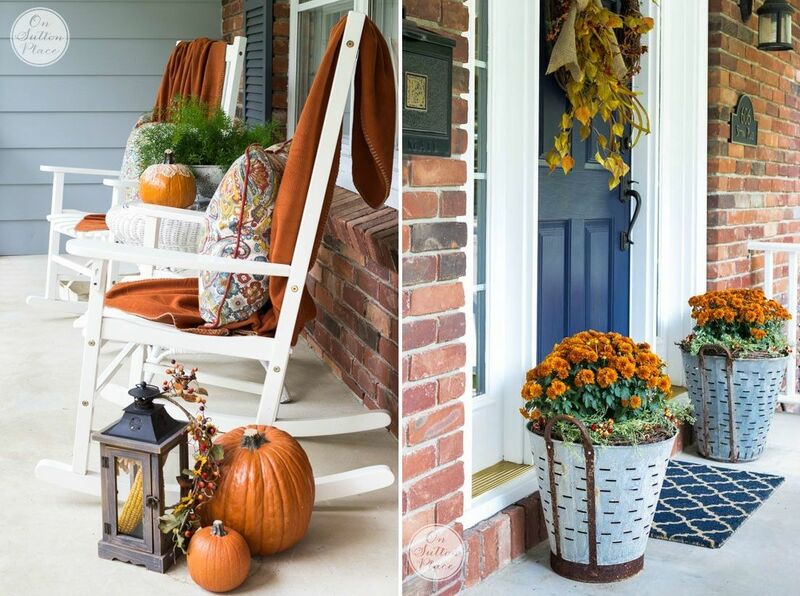 There are a lot of great ideas when it comes to fall porch decor and we’ve gathered some of out favorites here so we can share them with you. Yes, we said fall is all about the oranges, the yellows and the browns but you can successfully come up with a stylish fall porch decor even without relying on these nuances. Perhaps something simpler based on shades of white and soft neutrals can suit your style. You can find inspiration on thegracehouseinteriors. It’s not really fall without pumpkins. They come in all sorts of shapes and sizes and even in different colors and you can take advantage of this variety to create a simple and at the same time beautiful front porch decor. You can put a few pumpkins on display and you could also add a few planters with colors that match the pumpkin-themed palette. The combo featured on lizmarieblog is exactly what we’re talking about. 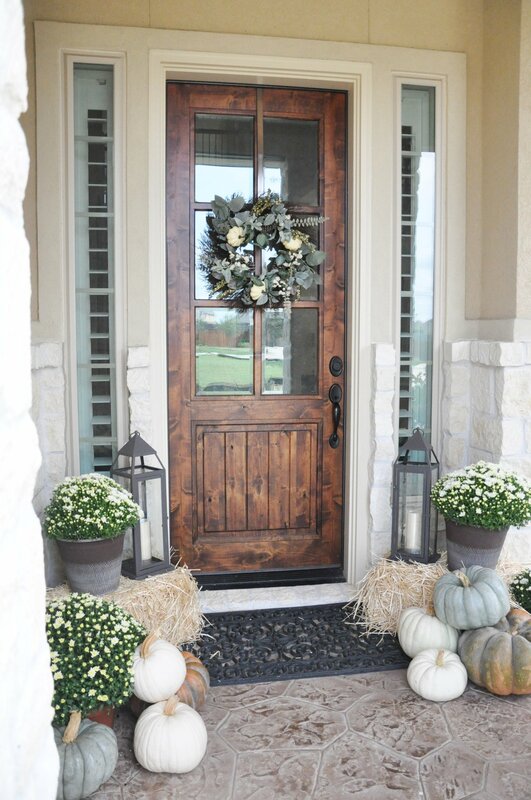 Pumpkins and autumn flowers go hand in hand, as also proven by this beautiful porch decor featured on homestoriesatoz. The soft pastel colors of the pumpkins are complemented by the vibrant yellow-ish tones of the flowers, a beautiful combo, especially taking into consideration the design of the front door as well. There’s a lot going on here. 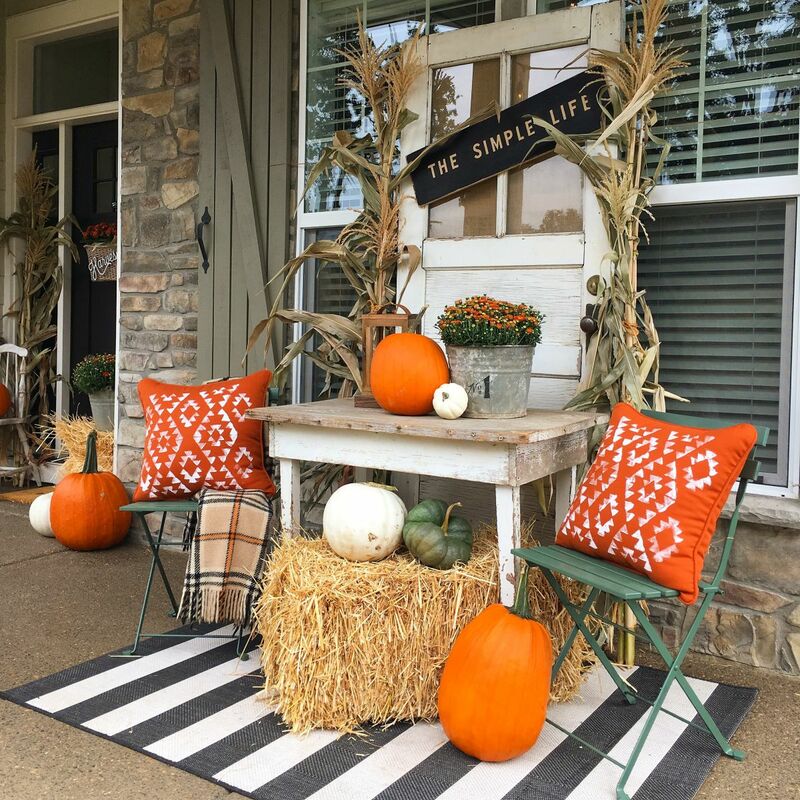 The fall porch decor featured on yellowprairieinteriors brings together a variety of different elements such as an upcycled door, corn stalks, a hay bale, pumpkins of different colors and sizes and orange accent pillows which contrast with the green chairs. It’s an eclectic decor with a soothing and cozy feel. Fall-themed decors are often associated with rustic and retro styles and such combinations turn out to be very stylish. A nice example is this front door decor which blends neutrals with metallic details, the result being elegant and simple without lacking character. The inspiration comes from tarynwhiteaker. 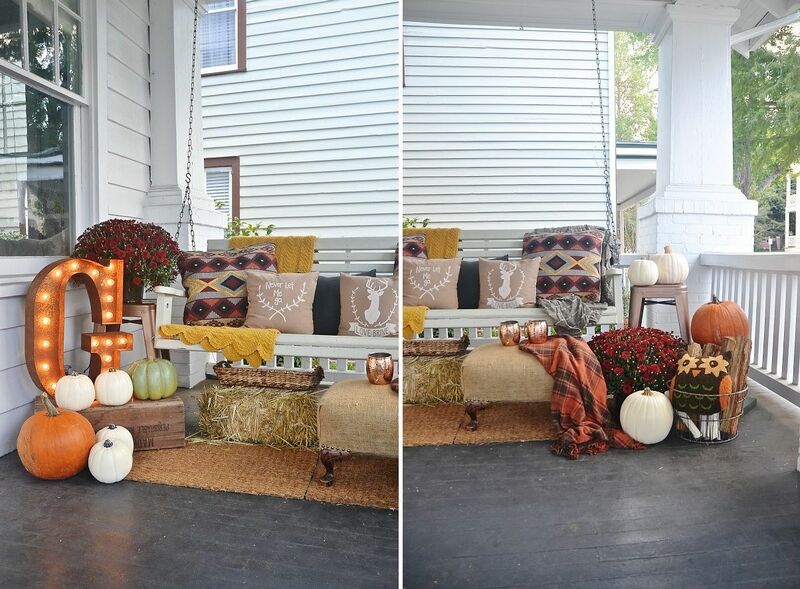 This fall porch decor from fynesdesigns is symmetrical…but not quite. The decorations displayed on either side of the front door mirror each other almost perfectly but have enough differences to also contrast with each other. We really like the tree trunk tables and the pink flowers which stand out and add a fresh touch to the whole ensemble. Wreaths are quite common and you can always rely on them to complete your themed decor in a way that looks classy and charming but what if you were to replace the wreath with something else like a basket of apples for example? That could actually look really cool. The idea comes from savvysouthernstyle. A great thing about fall decors is that they don’t need to be sophisticated, luxurious or very detailed in order to look awesome and to capture the essence of the theme they represent. 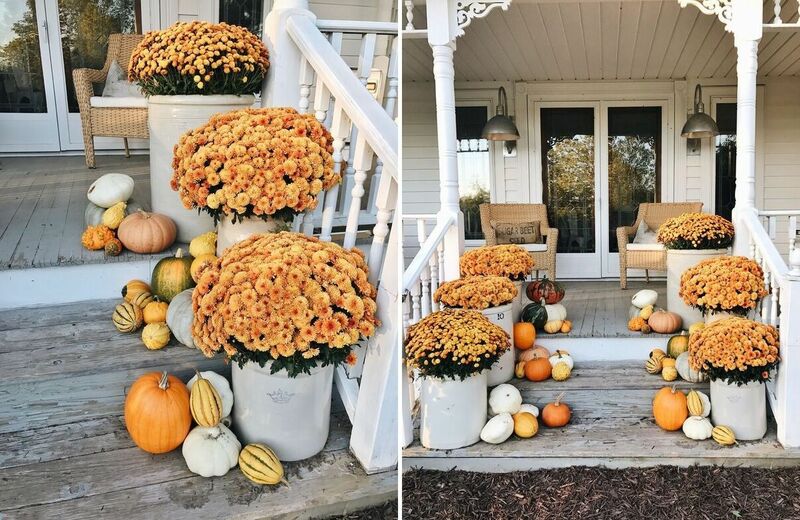 Something as simple as a bucket filled with pumpkins, foliage and corn cobs can look super chic, as you can see on stonegableblog. You can make a lot of lovely fall-themed decorations using foliage. Wreaths and garlands are the most common examples. You could frame your front door with them. 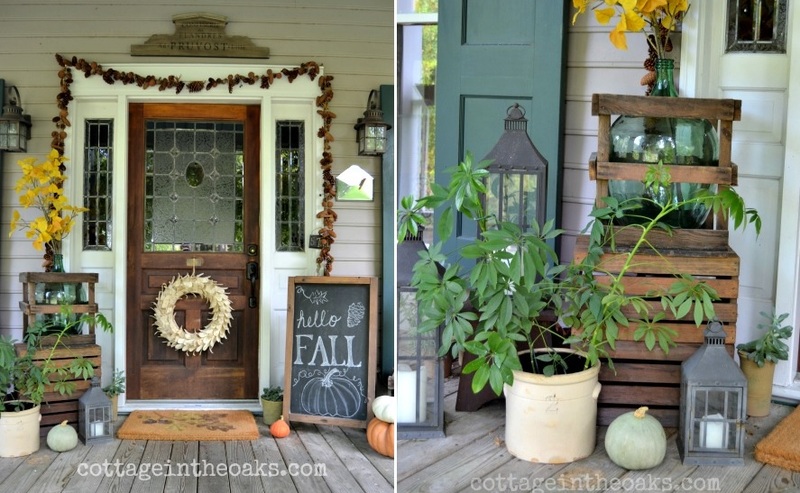 Add a few more ornaments to the mix and you have an easy fall porch decor with plenty of character. Find more inspiring ideas like this one on frommyfrontporchtoyours. 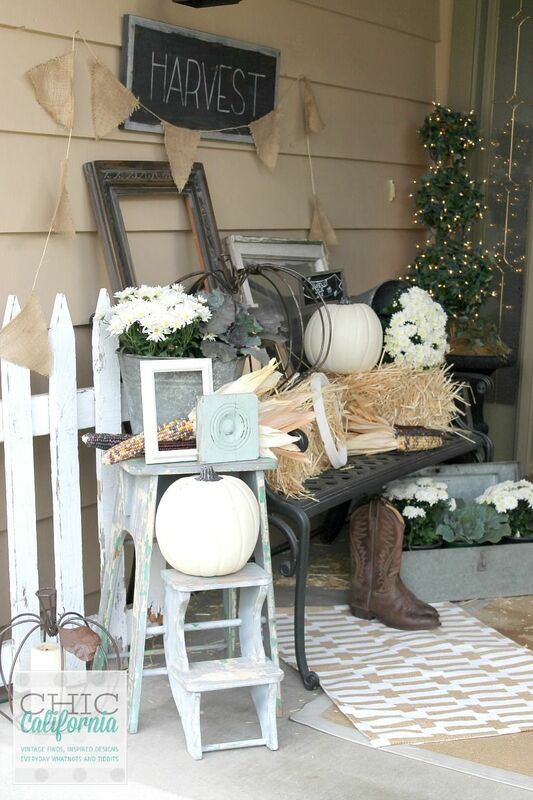 Corn stalks are the underdogs of fall porch decor and yet they can be used in a lot of interesting and creative ways. For example, you can decorate the columns or railings with corn stalks or you can display them in bouquets in barrels or large containers. Find more inspiration on ourvintagehomelove. 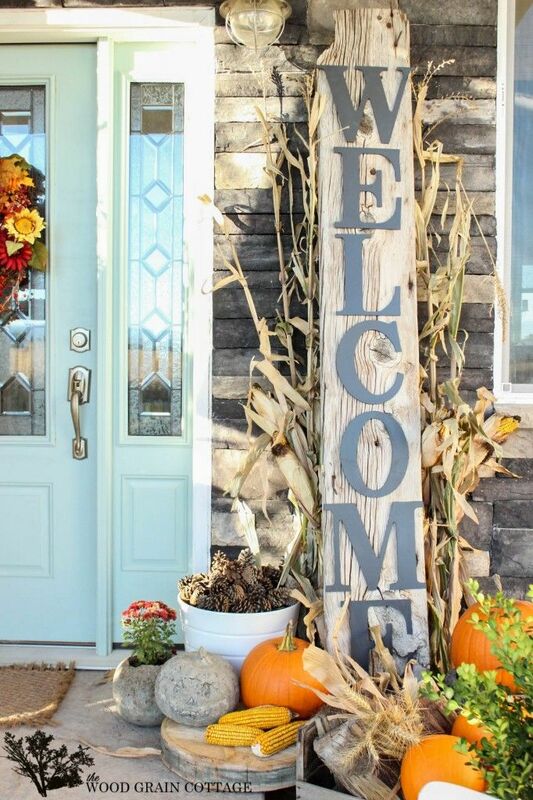 You could also welcome fall with a custom sign which you can display on your porch along with a few other decorations. A simple chalkboard would do just fine. Write a cute message on it or draw something. You can reuse the board for Thanksgiving Day, Halloween and other events. The other ornaments could be repurposed too. Check out cottageintheoaks for more ideas like this one. 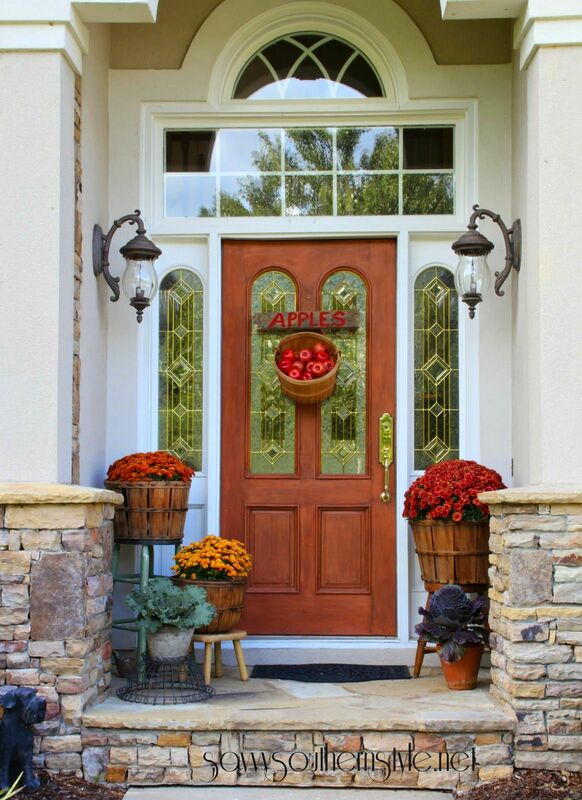 The main objective of decorating the front porch with fall-themed ornaments is to capture the beauty and the essence of the season in a way that makes this space look charming, cozy and welcoming. How about a side made out of a hay bale or some pillows and blankets in autumn colors? That could look lovely in combination with some pumpkins casually displayed on the porch and perhaps even a chic sign that lights up at night. These ideas and more and can be found on lizmarieblog. If you find the fall theme to be too vague or complex, try focusing on something more specific. 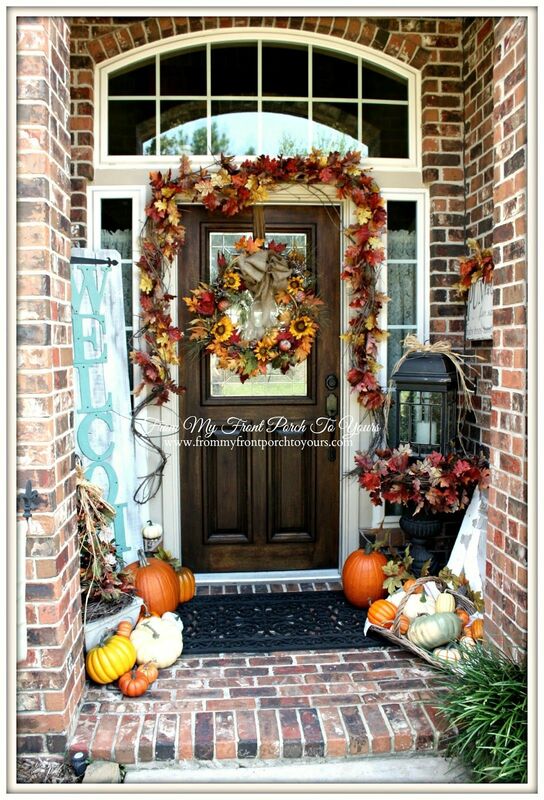 For example, your front porch decor can revolve around the harvest theme. You can put together decorations which showcase the county of the season and you can find a lot of the things you’ll need in your own garden. Check out aehomestylelife for more inspiration. 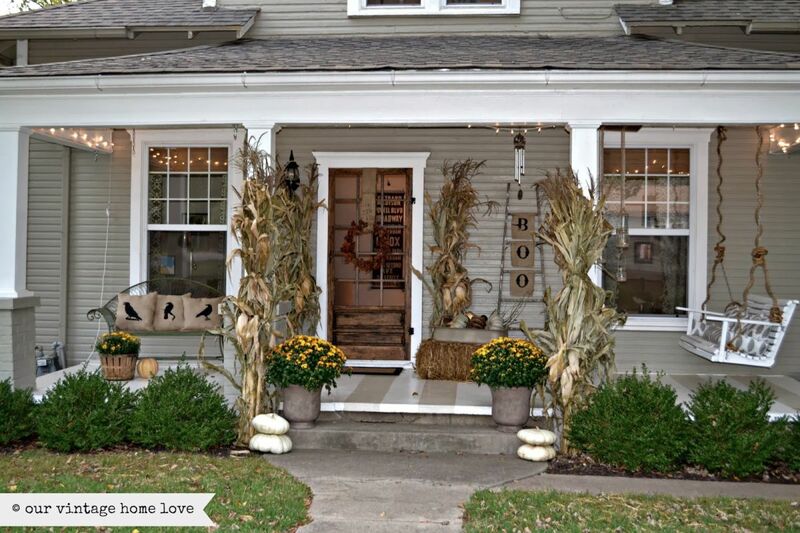 The humble corn stalk is featured here in the context of a very lovely porch decor which includes a lot of autumn’s treasures like pumpkins and pinecones plus beautiful seasonal flowers. There’s a nice mixture of textures and colors here too. The decor was featured on thewoodgraincottage and includes a wooden Welcome sign which increases the house’s curb appeal in a really cute way. You can also see this colorful wreath displayed on the front door. It’s made with seasonal flowers. 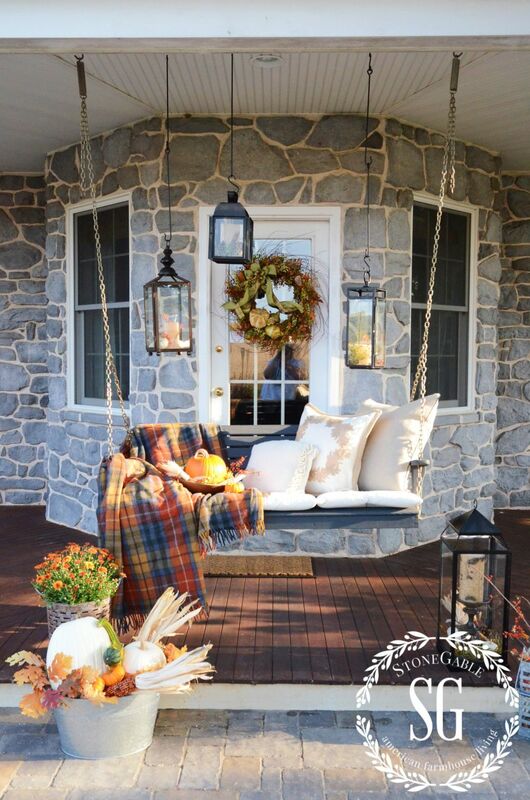 You don’t have to completely reorganize and redesign your porch to make it ready for autumn. It’s enough just to add a few things to the existing setup. For example, put a cozy blanket or a throw pillow on the chair, a few pumpkins on the floor and maybe a few other ornaments too. You can pick your favorite ones from our list or come up with your own ideas. You can find a few on onsuttonplace. 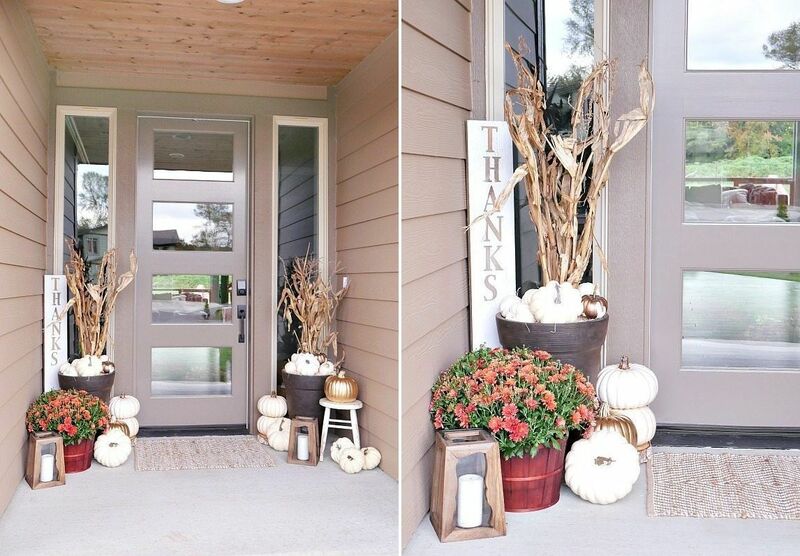 The post Fall Porch Decor Ideas Anyone Can Pull Off This Year appeared first on Home Decorating Trends – Homedit.